On Sunday, 27th Jan 2019, Aidha along with a group of foreign domestic workers (Aidha students and non-students) headed to Facebook’s Asia-Pacific office for a presentation on using Facebook for business from 9.30am to 1pm. 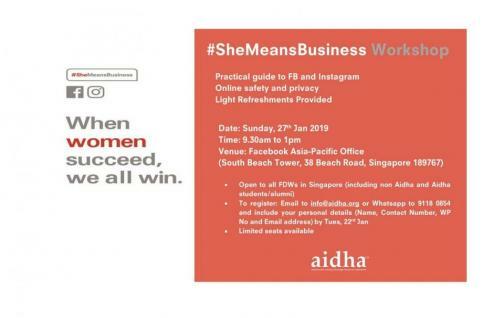 It was quite an exciting day as Aidha partnered with #SheMeansBusiness. Participants learnt how free apps can be used to create engaging content which can be used for business growth. The Facebook team led the presentation and shared tips on how to use free apps to create content and the importance of privacy/security when using Facebook. They also highlighted to the attendees the difference between Business vs Personal Profile Page – which is crucial to anyone kickstarting their company. A big thank you to the Facebook team for organising the workshop and sharing all those great insights with our students. Click here to see the pictures of the event.